The Divisional Police Officer in the National Assembly, CSP Sulu-Gambari Abdul, on Wednesday blamed the April 18 invasion of the Senate and removal of the Mace by hoodlums on internal conspiracy. Abdul stated this during an investigative hearing into the incident by joint ad hoc committee investigating the incident. According to him, what happened at the National Assembly was an act of internal conspiracy among some security agencies and some lawmakers. “There should be cooperation between security agencies and the lawmakers but in this case, the attack came from the roof as the senators are not helping security matters. “On April 16, there was an earlier hint that a group planned to invade the National Assembly and disrupt activities, which called for a build-up of security with two units of mobile police mobilised to the complex. “However, on April 18, at about 11 a.m., my attention was drawn to a group protesting at the gate, and while I moved to address the group, I was informed that some people were running away with the mace. “I signalled all the entry points that nobody drives in or out but three men approached me identifying themselves as security operatives and requested to be allowed to go. “The strain of blood on their clothes made me suspicious and I ordered their arrest. “In all, six people were arrested same day and handed over to the Force Headquarters alongside charms recovered from them. “In addition, an unmarked Prado jeep and a Toyota Hilux were impounded and they are with the police. “It was later that I observed that the protest was a diversionary attention to move me out and that the protesters were same group with those that attacked,’’ Abdul said. He said that there was no communication from the Sergeant-at-Arms to the National Assembly during the invasion by the thugs. 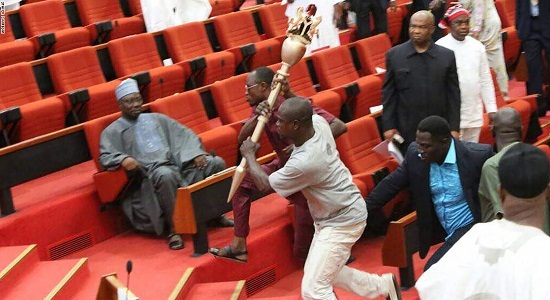 Earlier, the Sergeant-at-Arms, Mr Brighton Danwalex, had said that report from investigation after the incident revealed that Senator Ali Ndume instructed the men assigned to protect the mace not to touch it during the invasion. According to him, it was wrong for them to take orders from Ndume. “Security men are having challenges with some legislators because they don’t want to follow checks,’’ he added. Danwalex said that security men were overpowered due to lack of non-functional security gadgets to enhance operational capacity. “There is no functional walkie-talkie; we would have alerted all the exit points. “The CCTV is not functioning and there is only one operational patrol vehicle and the entrance into the white house requires biometric doors,’’ he said. Chairman of the committee, Sen. Bala N’allah, requested the Police to furnish it with copies of station diary where entry of the crime was made. He also directed that the committee should be given copies of the crime routine diary, pictures of those arrested and the transfer register explaining where the invaders were transferred to. On her part, the Co-Chairman of the committee, Rep. Betty Apiafi, blamed the invasion on negligence on the part of the Sergeant-at-Arms. She accused them of failing to raise alarm having observed something unusual. Similarly, Sen. Shehu Sani, accused the security operatives in the complex of regularly collecting money to allow unauthorised persons into the premises. “People troop in here by paying money to security. Supposing they were terrorists and had it been that they came in to kill someone, they would have succeeded. “How could five thugs succeed if there was no collusion? Sani said.